...a Severe Thunderstorm Warning Remains In Effect Until 100 Am Cdt For Southern Reagan County... At 1244 Am Cdt, A Severe Thunderstorm Was Located 8 Miles Southeast Of Big Lake, Moving East At 30 Mph. Hazard...quarter Size Hail. Source...radar Indicated. ...Read More. The National Weather Service In San Angelo Has Issued A * Severe Thunderstorm Warning For... Central Brown County In West Central Texas... East Central Coleman County In West Central Texas... * Until 130 Am Cdt. * At 1238 Am Cdt, A Severe Thunderstorm Was Located Near Bangs, Or 7 ...Read More. The National Weather Service In San Angelo Has Issued A * Severe Thunderstorm Warning For... North Central Crockett County In West Central Texas... West Central Irion County In West Central Texas... * Until 115 Am Cdt. * At 1223 Am Cdt, Severe Thunderstorms Were Located Along A Line ...Read More. The National Weather Service In San Angelo Has Issued A * Flash Flood Warning For... Brown County In West Central Texas... Central Coleman County In West Central Texas... * Until 315 Am Cdt. * At 1215 Am Cdt, Doppler Radar Indicated Thunderstorms Producing ...Read More. ...the Flash Flood Warning Remains In Effect Until 200 Am Cdt For Southeastern Denton...southern Collin And Northern Dallas Counties... At 1213 Am Cdt, Doppler Radar Indicated Moderate To Heavy Rainfall Continues Across The Metroplex. Up To Five Inches Of Rain Have Already Fallen Across Southeast Collin County. Flash Flooding Will Likely Continue For The Next Few Hours. ...Read More. Palestine Police Department Lt. Gabriel Green addresses a group of local preachers and congregation members at an active shooter informational meeting held Wednesday, Nov. 8 at First United Methodist Church in Palestine. Photo by Cheril Vernon / Messenger. PALESTINE – In response to the deadliest mass shooting in Texas history at a small South Texas church on Nov. 4, the Palestine Police Department (PPD) met with local clergy members on Wednesday, Nov. 8 to offer their assistance and to see if there was interest in the department offering free active shooter training classes for area churches and their congregations. Just days ago, Devin Patrick Kelley, 26, of New Braunfels, interrupted a Sunday morning church service at First Baptist Church in Sutherland Springs, about 40 miles southeast of San Antonio, with gunfire, killing 26 and injuring at least 20. The victims in the mass shooting range in age from 18 months old to 77 years old, including eight children and teenagers. “We would like to educate the whole congregation. We don’t want them to be afraid. 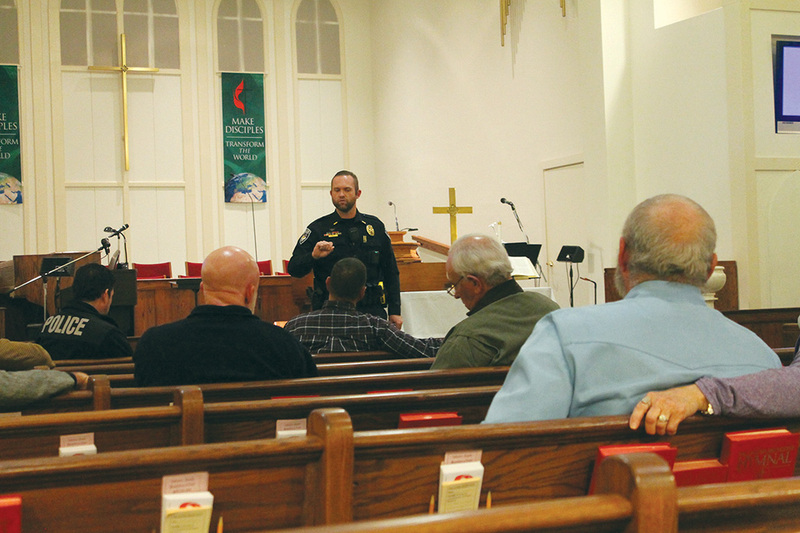 If you have a knowledge base, then it helps you know how to respond and you will reach for it from somewhere,” PPD Lt. Gabriel Green said during a meeting held for local church leaders and congregations at First United Methodist Church in Palestine. Based upon recommendations from those in attendance, the PPD will offer two free civilian active shooter training classes – one on a Saturday morning and the other on a Monday night to accommodate various schedules. The first class will be held from 10 a.m. to noon Saturday, Nov. 18 at First Baptist Church, located at 5700 N. Loop 256 in Palestine. The second class will be held from 6:30 to 8:30 p.m. Monday, Nov. 20 at Triple SSS Cowboy Church, located at 299 U.S. 287 North in Palestine. The police department also offered advice for local churches in case something like what happened at the Sutherland Springs church happened in East Texas. The police officers reiterated the best way to protect a group of people from an active shooter is to attend special training,. Then, have the congregation practice drills so if something like that were to happen, the congregation would be ready. “Get away if you can, If you can run and get out of the building, get out of the building as fast as possible and take whoever you can with you. If you can’t do that, hide and barricade yourself as much as you can,” Green said. If something goes down similar to how it was in Sutherland Springs, where the person enters the sanctuary -and there is no time to get away – it’s time to fight, Green said.